Chinese artist Ai Weiwei’s first major exhibit in the United States – “According to What?” – opened a few weeks ago at DC’s Hirshhorn Museum. Taking up almost the entire 2nd floor of the museum as well as a couple of spaces on the ground floor and third floor, According to What? is extensive and impressive. 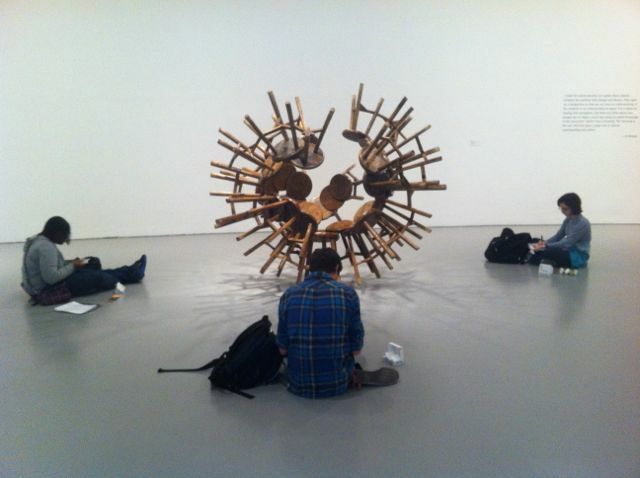 I instantly “got” the message that Weiwei was trying to convey. His exhibit is a commentary on the modern overtaking the ancient, of might overtaking right. I’ve described the exhibit in this article on my USA Travel site and that piece also includes links to more scholarly reviews of the exhibit than I can provide. Following are some photographs I took inside “According to What?” I cannot stress to you enough how cool this exhibit is, so check it out at the Hirshhorn before February 24, 2013. After that, it will travel to some other cities in the USA, including Indianapolis, Miami, and Brooklyn.